A powerful multi-use underwater torch that offers both a wide beam at 65 ° and a concentrated beam at 15º to perfectly adapt to different diving conditions. Five lighting modes plus an emergency signaling mode for maximum versatility, with a single control button to facilitate use. Extremely reliable: the waterproof battery compartment is insulated, so even if the O-ring fails, the water can not reach the internal electronics. The torch comes complete with rechargeable battery, charger, and spare parts, a simple two-dimensional Goodman handle, a pistol grip and a GoPro adapter for the Goodman handle: all packed in a convenient EVA carrying case. 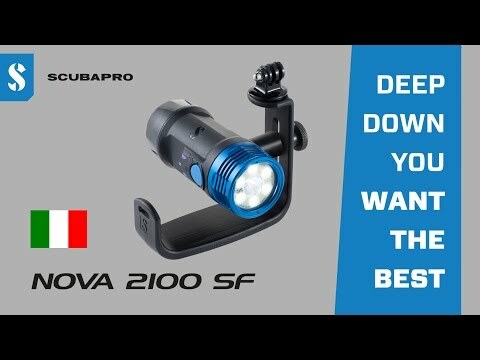 NOVA 2100 can also be purchased without handles, so you can use it with video arm supports. It will be supplied with a line, 25 W rechargeable lithium-ion battery, AC adapter, battery charger, international adapters, spare O-rings, O-ring lubricant, O-ring removal tool, all assembled in a transport bag in EVA. Double configuration: a powerful beam with a 65º lumen of 2100 lumens and a concentrated beam of 15º with 800 lumens. Five main lighting modes: 100% wide beam, 50% wide beam, 100% concentrated beam, 50% wide beam + 75% concentrated beam and 25% wide beam + 50% concentrated beam. Emergency signaling mode that generates a flash of a second and a Morse code of SOS. To activate emergency mode, simply hold down the power button for four seconds. Simple one-button control that allows turning on, turning off, adjusting brightness and changing the beam angle. 55 minutes of autonomy at full power, constant brightness. Tested at 100m / 328ft depth. Corrosion-resistant metal lighting head to improve heat dispersion and increase durability. Battery compartment completely insulated to protect the internal electronics from water infiltration. Universal support 1 / 4-20 compatible with Goodman handle, monopod or optional YS adapter. SCUBAPRO UW illumination head, 25W rechargeable Li-ion battery, AC adapter, charging stand, international adapters, spare O-rings, O-ring lubricant, O-ring removal tool, carrying case in EVA with foam insert and instruction manual. In addition, a wide and narrow Goodman handle, a pistol grip, cable (line) and a GoPro adapter are included.